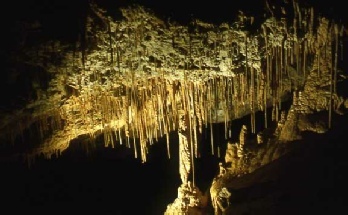 Grotte Roche was Speleo Vercors summer 2009/2010 project. 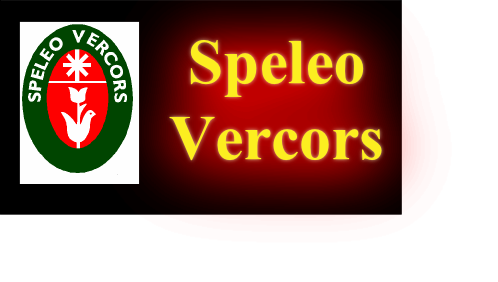 It is important to stress that we had nothing to do with the discovery of the new extensions, but it became obvious that this was going to become a “really good trip”, and since the description in Speleo 66 was so vague, we decided to produce the following description. Access: The entrance is at river level in the Bourne Gorge. There is an obvious parking area on the north side of the gorge about half way between the two bridges (Pont de la Goule Noir and Pont de la Valchevriere). A path (near the yellow warning sign) descends from the parking area to the cave entrance. 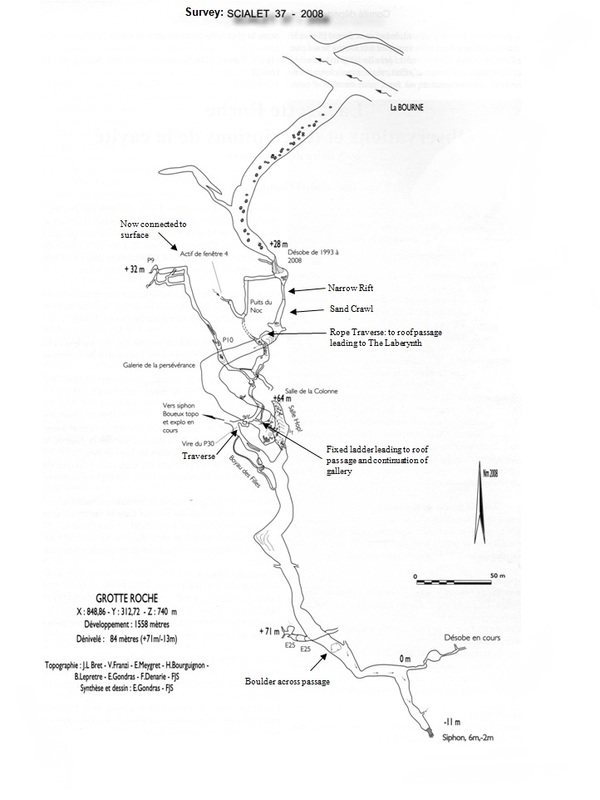 The cave entrance is marked on the map. 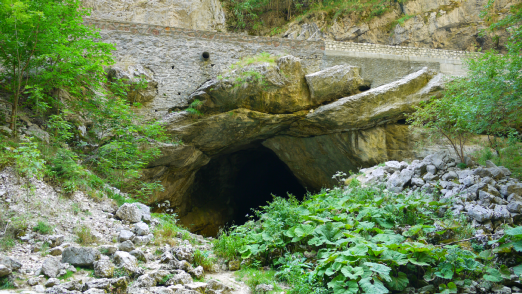 History: The cave has been known since the 18th century and is a popular cave for outdoor centers to take novices. In June 2008, approximately two kilometres of new passage were discovered with excellent formations, and varied and enjoyable caving. The new extension is due to the perseverance of Jean-Louis Bret, Jean-Pierre Mericet Jean Brunonttou of the FJS (Furets Jaunes of Seyssins), who have worked in the cave since 1993, using some clever techniques to remove huge quantities of sand (1000 m3). The breakthrough occurred on June 8, 2008. Description: The first part of Grotte Roche (where they take novices) is very impressive. From the railway tunnel sized entrance a well trod path leads up over and through massive boulders for 150 metres until eventually reaching the highest part of the cave and the roof. The way on (to the new extension) is to the left, up through big boulders which have been chemically repositioned, under a cascade (which was redirected to remove many tons of sand) into the breakthrough chamber with impressive banks of stratified sand. Straight on from here (ignoring the passage in the roof “Fenetre 4” – which has now been pushed to the surface) a scramble up leads to a narrow descending rift. The rift descends into a sandy crawl which soon emerges into the vastness of “Gallery de la Perseverance” (note the fixed rope on the right which leads to a parallel roof passage and alternative return route - the Reseau Labyrinths - Networks Anastomoses). The way on descends into the gallery, following a taped route to protect the excellent mud and calcite formations. The gallery is very impressive being about 20 X 25m, with beautiful mud and calcite formations. Part way along, the gallery bears left at some fine formations (on the floor) and then descends slightly to another left bend at some fine formations high on the left hand wall. At the end of the gallery, a short climb of 4 metres (on the right) takes you around a splendid column and further formations and leads to a fixed ladder (well sort of fixed...). This first section of the new cave is suitable for novices. The next section is not so straight forward. The ladder enables you to enter a roof tube that is about eight metres long (use cowstails for protection at the top of the ladder). The body sized tube bears to the left and ascends to a short squeeze before arriving at an ascending cross passage. To the right (downhill) is The Labyrinth, a confusing three dimensional maze which leads back to the start of the Gallery de la Perseverance. (Fortunately it is really well route marked with unsightly tape, otherwise, it would be a really difficult section of cave to navigate). Turning left (uphill) an easy hands and knees crawl passes some holes on the left and leads to the 30m Puits de la Vire. The pitch is in three sections, the first, a steeply sloping (and slippery) rift which leads to the second section, a vertical slot, fitted with re-bar staples (ala via ferrata). (Speleo Magazine suggests this pitch is free climbable, just using cowstails for protection on the staples. However, the bottom of the slot opens into the side of an impressive rift, so falling anywhere here is likely to be painful). A 35m rope "just" does the slanting pitch, the slot pitch and the traverse across the following rift. Use the second staple as a rebelay (it makes getting off the slot pitch so much easier coming out) and use the last staple as a rebelay (as it makes getting to the short drop to the ledge at the start of the traverse easier as well). There should be 4 slings on the traverse, but the second was missing in August 2010. (The third sling is hidden behind a flake). Equipment list for Puits de la Vire: 35m rope (minimum), 8 krabs, 5 slings (just in case some are missing). The bottom of the slot pitch breaks out into the side of a great fault richly decorated with formations. (At the bottom of the rift is a muddy sump). The continuation is a traverse across the rift. The traverse leads to a breakdown passage which leads back into the main, wide phreatic tunnel. Over on the left (by two small stal columns) is an inconspicuous ascending crawl over blocks that leads into Salle Hopf - a very pretty chamber. The main way leads to bigger and bigger passage. There are some really pretty formations in the first third of the passage, but then it just gets bigger and bigger, passing under a jammed block the size of a family car , before finally closing down at the sump. There appear to be leads everywhere and local cavers are still pushing the cave. On the way out, there is the option of going via the Labyrinth. This will probably take about 15 or 20 confusing minutes of grovelling in a three dimensional muddy maze (not fun when towing a tackle bag). Going feet first down the ladder tube takes about 1 minute! (go feet first, as it is not possible to turn around at the top of the ladder).